Poor safety, slow trains and demand fast outpacing the capacity are the main challenges being faced by the Indian Railway (IR). The question that should be asked is why Indian Railways is not able to safely move its trains at 100 to 130 km/hr when railways outside are carrying trains at a much higher speed of 160 to 200 km/hr with the infrastructure and rolling stock based on practically the same technologies? Till about 1985, things were not so bad, and the root cause of the problems IR faces today is that in spite of huge investments between 1985-2005 in strengthening the track and other infrastructure on its trunk routes and acquiring the latest rolling stock, it failed to complete the last mile works to unlock the full potential of its network. The need to complete upgradation of the trunk routes is not a priority anymore. Instead, the IR has dreams of catapulting itself to the front ranks of the world’s advanced railway system with farfetched ideas like introducing bullet trains (high speed rail, HSR) and building dedicated freight corridors (DFCs). In rail transport worldwide, raising speed of trains has been the key to increasing capacity simultaneously with providing faster passenger and freight services. Notable examples are the railway systems in Western Europe, North America and China. 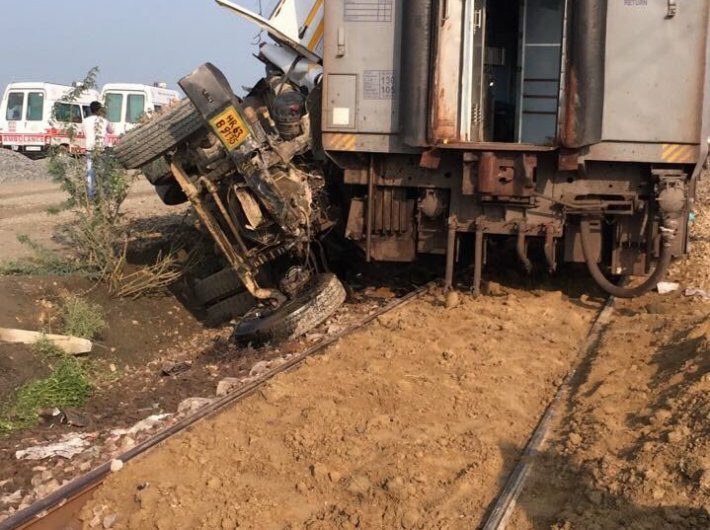 The August 19 accident near Khatauli station, which killed 23 passengers, is a warning of the dangers of rising over-utilisation of the trunk routes. The section where the accident occurred carries trains far in excess of its capacity. It carries 35 trains daily against capacity of 25 trains with two hours for maintenance that is over-utilisation of 140%. For optimal performance (maintenance, operations and safety) utilisation should be less than 90% of the capacity. Reportedly, the train-controllers refused block (temporary suspension of traffic for carrying out a routine or emergency maintenance) to replace a fractured rail. The maintenance staff started repair, just when the train approached the site at full speed and derailed. Over-utilisation of line capacity, rail fracture and carrying out repairs without block or with inadequate block has become a common feature of IR’s working. According to the latest data, utilisation exceeds capacity on 65% of the high density sections; utilisation is 120-150% on 32% of the sections and more than 150% on 9% of the sections. Rail fractures are a symptom of overstressing the track. Congestion on the lines leaves little time for maintenance, which is hurriedly carried out in the time available. On the IR, about 5,000 rail fractures are reported annually. The real number is much higher, because it is an open secret in IR that only those rail fractures that cause detention of trains are reported. On better railway systems rail fractures are very rare. A rail with incipient cracks will be detected by inspection and removed before it fractures in track. With inadequate maintenance and increased wear and tear, the track also requires frequent renewals. Maintenance of rolling stock also suffers as often there is less time at the terminals to carry out safety inspections and maintenance. The focus of the organisation has shifted to daily fire-fighting to somehow keep trains running, leading to all sorts of maladies in the organisational culture like inter-departmental tussles and low morale. Engineers are expected to behave more like managers and administrators and less like expert professionals. For a proper understanding of the magnitude of failure of IR to upgrade its trunk routes, it is necessary to look at what the Chinese Railway (CR) has achieved in this regard. Till mid-1990s, CR was way behind IR in modernising its network, with the maximum speed of trains limited to 100 to 110 km/hr. IR had raised speed of trains from 100 km/hr to 130 km/hr in 1969-72 on Delhi-Howrah and Delhi-Mumbai routes when it introduced Rajdhani train services. But, things rapidly changed as CR surged ahead. Starting in April 1997, CR undertook a “speed-up” campaign to raise speed in six rounds on its trunk routes. In ten years (1997-2007), it raised speed to 160-180 km/hr on 14,000 km route length, and 200 km/hr on 5,370 km length. Simultaneously, speed of freight trains on these upgraded trunk routes was raised to 100-120 km/hr and axle load to 25 tons from 22.5 tons. This upgradation and speed-up of trains increased the line capacity by 60% to 90%. Travel time was drastically cut. For example, the journey time from Beijing to Shanghai (1,463 km) on CR’s busiest route was reduced to 11 h and 55 m in 2007. By comparison the fastest train between Delhi and Howrah (1,451 km) even now takes 17h 05m. If IR had upgraded the line, the journey from Delhi to Howrah could have been reduced to about 11h 45m for convenient overnight travel. Using tilting trains (225-260 km/hr), the journey time could have been further reduced to about 8h. Similarly the journey time from Delhi to Chennai could have been reduced from the present 28h 15m to about 12 hrs. IR had in fact started upgrading its trunk routes in early 1980s. From 1985 to 2005, IR made massive investment to upgrade the track and other infrastructure over thousands of route length, imported locomotives and coaches and upgraded its fleet of wagons (see box: Massive investments). But IR repeatedly failed to carry out the last mile works (Easing of some sharp curves, strengthening some bridges, improving track geometry to tighter tolerances, cab signalling, and fencing in congested areas to prevent trespassing). The last mile works are tough to execute and require immaculate planning and precise execution. Regular blocks are needed for which some freight trains may have to be diverted to alternative routes, some passenger services may have to be curtailed, and services that can be catered to by road transport - like short distance passenger trains - shall have to be closed. Maintenance and operational skills and practices also require quantum improvement. Since 2005, the plans to complete upgradation of the trunk routes seem to have been kept in abeyance. It seems IR now wants to build a large number of HSR lines and DFCs. These are extremely costly systems which are inappropriate for India at this stage of economic development (see box: Costly and inappropriate). When the plan to build the DFCs was announced by the ministry of railway, Dr E Sreedharan, India’s best known railway engineer, had questioned the wisdom of building the DFCs. Later, when survey for the HSR line from Ahmedabad to Mumbai was announced earlier this year, he said that India can wait for HSR. The author was part of the team at Research Designs & Standards Organisation (RDSO) that had carried out feasibility studies in 1993-95 to raise speed to 160 km/hr on the selected routes. In March 2007, as China was completing upgradation of its network to 200 km/hr before it moved to build new high speed lines, the author submitted to the railway board a study of how railways across the world had upgraded and expanded their networks using different approaches that suited their geography, demography and level of economic development. Then chairman railway board had shown keen interest, but he was to retire shortly. Eventually, nothing concrete happened to put back upgradation of the existing network as IR’s top priority. A measure of how costly a HSR line is, and how cost efficient upgradation of the existing network is offered by the following comparison: To build just two HSR lines (Delhi to Mumbai and Delhi to Kolkata totalling about 2,600 km in length) would cost about Rs 4-5 lakh crore. With this much money, it shall be possible to not only upgrade the entire 20,000 km network of IR’s trunk routes (average cost Rs 12 crore/km), it will also be possible to build new double line routes on the six routes (11,000 km) of the Golden Quadrilateral and its diagonals (average cost Rs 15 crore/km). •	The existing lines shall carry fast conventional trains (160 to 200 km/hr) and tilting trains (225 to 250 km/hr) and freight trains (100 to 120 km/hr). •	The new alternative routes will carry slow passenger (100 to 130 km/hr) and freight trains (70 to 90 km/hr). With the thus upgraded and expanded network of lines, following benefits will accrue: IR’s network capacities will more than double; Journey time will reduce by one-third of the existing time by conventional trains and to half by tilting trains; and good safety, reliable operations and reduced cost of maintenance and renewals. As promises and grand schemes of bullet trains and DFCs are doled out, IR officials are not giving the full picture to the country. Past failures are being brushed under the carpet. Why should the country build separate networks of HSR lines and DFCs, if at a fraction of that cost (about 20%) it will be possible to meet the transportation needs for at least next twenty years by upgrading and expanding the existing network? IR officials have a tendency to blame under-investment and lack of technological inputs for its woes. Clearly what IR is suffering from is lack of will power, capacity for hard work and judicious planning not lack of technology. It does not need as much more investment as investment in the right place. It is time to shift focus to completing the long pending last mile works of upgrading the trunk routes to unlock their full potential so that the entire nation can realise the benefits of faster and safer travel and adequate capacity to meet the demand. Else, the situation would rapidly worsen.